First read the description for Candelariella vitellina f. vitellina elsewhere on this web site. 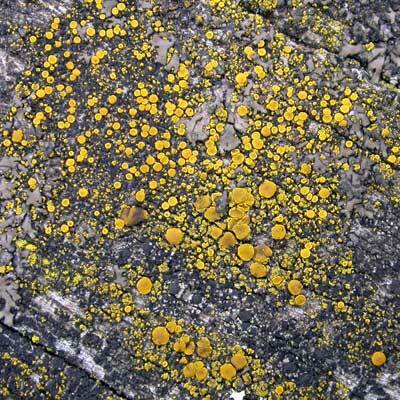 C. aurella differs in its thallus of scattered, mustard-yellow granules on a black prothallus. C. aurella is well adapted to urban settings and will grow well on garden walls in large towns and cities that are constructed from calcareous rock or brick. It has a K negative reaction. Simms, M. J., (2016). 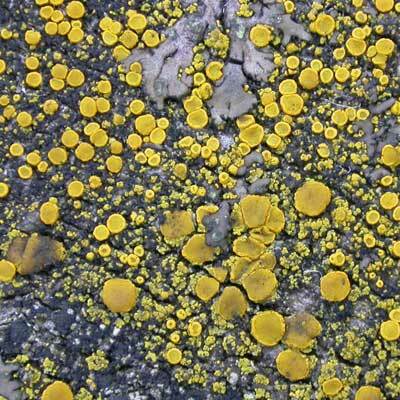 Candelariella aurella (Hoffm) Zahlbr.. [In] LichenIreland.